to Quark or not to Quark?? - SolarChat! to Quark or not to Quark?? Hello! 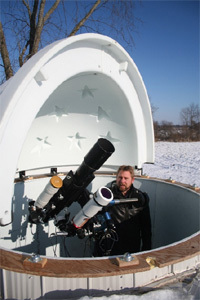 my name is Eddie, i am new to Charlie Bates, love the movement, i live just outside of Toronto Canada an have been an avid amateur astronomer my whole life practically, in the last year i have discovered a passion for solar after looking through a PST. One week later i bought a PST and loved it, a month later i bought a Lunt 60 tilt tuned and b1200 with feather touch, loved that, then recently had it pressure tune retrofitted by Lunt which i greatly enjoy, however, my first choice was a Quark when i was shopping around originally. Unfortunately i was discouraged by the endless negative reviews i read online about Daystars quality control, they seem to be fantastic when they work, if there are those out there who would be willing to lend their knowledge and experience i greatly appreciate it. Basically what I'm asking is, would anyone out there sell their Lunt LS60 for a Quark Chromosphere if they were offered a good one? I'm curious, i intend on imaging soon and i realize that full disc is not easy with the quark and thats ok. Has Daystar corrected their issues? its confusing because in the heap of negative reviews, there are those who would not trade their quark for anything and swear it blows away any dedicated scope they've owned. Re: to Quark or not to Quark?? No, I wouldn't swap my Lunt L60 for a Quark, because they both do different things. The Lunt is brilliant for full disc shots, and can be Barlowed up to get in closer. The Quark is limited to close in shots. The Lunt is better when the conditions are poor as the focal length is a lot shorter. plus you can grab some data very quickly in the Lunt whereas you might miss the opportunity waiting for the Quark to come onto band. I consider myself very fortunate to be able to have both. I did recently get an opportunity to get another Quark and I was amazed by the difference in them. The views and data are completely different. There seems to be a lot of variability with these things, so I'd recommend buying from a vendor that will accept a return without any hassle. I also think that the learning curve is steeper on the Quark. It's much harder to get sharp focus, is much more dependant on good seeing and it really needs an electric focus unit. I was glad to have a few years of solar experience under my belt before getting a Quark. Even then, the first few sessions were frustrating. Welcome to the group...you will find a few here from Southern Ontario, and I am located near Lindsay, ON. The comments about where the two systems fit posted by Stephen are very accurate. The LS60 is an excellent, all in one scope that can do many jobs form full disk to higher resolution with barlows. The hi-res is limited by the 60mm aperture and just how much effective magnification you can pull out of the scope. The Quark has had issues, but the good ones really show excellent results on larger apertures. Keep this filter to do medium to higher res imaging on larger apertures scopes in good seeing and it will pull off excellent images. There are learning curves to each filter, camera, and processing steps...always more to learn here. I have multiple solar scopes/filters, but the 80mm DS Lunt is my favorite...at times it out performs the 150mm and 250mm Ha filtered scopes.